This time of year, you and your son may be thinking about making a visit to a seminary. He may be accepted for the fall term or still thinking about it. After so much talk and talk about what seminary would be like, my son and I went for a visit in late June prior to his entrance in the fall. I did not want to see the place for the first time when he was moving in. I think I needed to take some of the mystery away so I could envision his life there. We went in the summer to get a first look and had a very nice guy entering 4th college show us around and answer questions about seminary life. It was good to visit during the summer because we were able to tour all areas of the seminary. If school had been in session, our tour would have been more limited as some areas were off limits for the privacy of the seminarians. Our tour guide introduced us to everyone from the cafeteria ladies to the dean. Everyone was happy to meet my son and welcome him. Our guide would introduce him as one of the “new men”. I was not accustom to hearing my 18 year old son called a “man”. But I have come to see that if you call them men and expect them to act like men, they will respond. I can guarantee you that at the tour for the state university, male students were never referred to as new men, but incoming freshman. The cultural expectations of a freshman in a traditional college are a far cry from the expectations of the new men in the seminary. If you want to visit the seminary, call ahead and make arrangements. It was great to have another seminarian give us a tour and answer our many questions. He was candid and provided lots of little details and suggestions from bringing a fan and an extra lamp to how the refrigerator in the common room was shared. He told us about the opportunities for intramural basketball and other sports when we stopped at the gym. Since it was just the 3 of us, we could stop and ask questions when we had them. I am sure my son was rolling his eyes at my practical and possibly “politically incorrect” questions, but the answers put my mind at ease. If the seminary has an open house or orientation day, you may have the opportunity to meet faculty, administrators and other seminarians. During an orientation day in August, we were welcomed by seminarians and faculty at an informal coffee and donuts session. Then, we went on another tour with other parents and new seminarians. 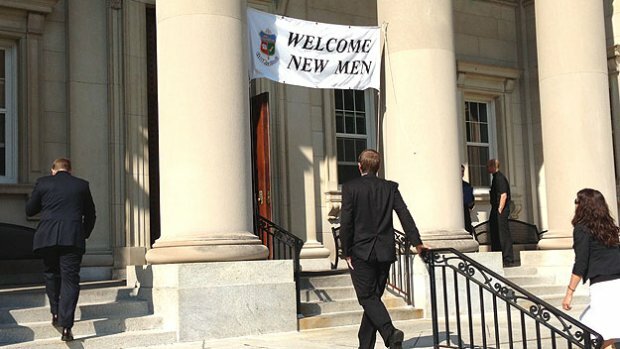 I was impressed with the other seminarians there to assist in welcoming the new guys. They were friendly, outgoing, joking around, joyful, sincere, helpful, kind and empathetic. I know it sounds like boy scouts, but they really seemed like great guys. Some were in “clerics” and others in t-shirts and shorts looking like they were going to play basketball after they finished giving the tour. This may not have been what the seminary wanted our tour guide to wear, but it made him seem more real, approachable and a regular guy. He was easy going, encouraged questions and answered candidly. There were no taboo topics or questions. Some parents on our tour asked him questions on the side. By the end of both of these visits to the seminary, I felt much more comfortable seeing and experiencing the seminary environment. Sure there were a few tears when we said good bye, but I did that when we took the older siblings to college. Taking them to a state university, I worried they would not get to mass on Sundays. In this case, I knew this son would be at mass 7 days per week. One less thing to worry about. This entry was posted on June 28, 2015 by Pam in General, Life Events, Reflections.